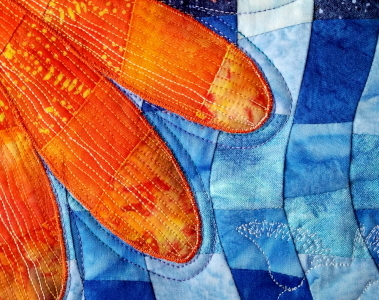 November Challenge Week 4 - my work » What's Under the Needle? This week Virginia sent me a photo of her challenge. 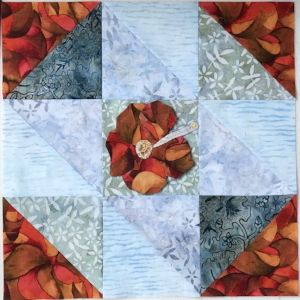 She chose a water background, bird's eye view, and hibiscus. 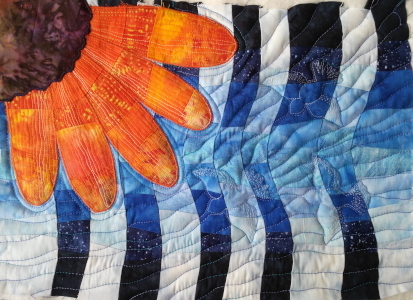 "I have always liked the 9-Patch but seldom found a pattern I was interested in. So thought this would be the challenge for me too," says Virginia. This is what she made. What a wonderful way to dress up a nine-patch! Thanks for joining in Virginia. 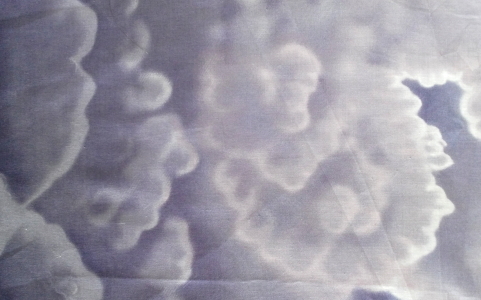 Now it is time for me to finish my quilt. 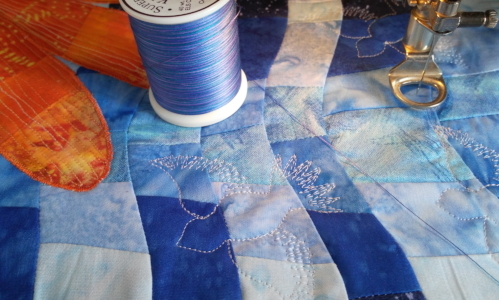 Before getting started on the quilting, I need a backing fabric. I think this one might be perfect. What do you think? To bring this piece together I'll start with the flower and free-motion the petals. 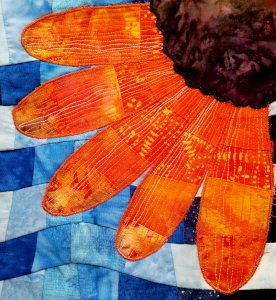 I selected a variegated orange thread and stitched back and forth along each petal. 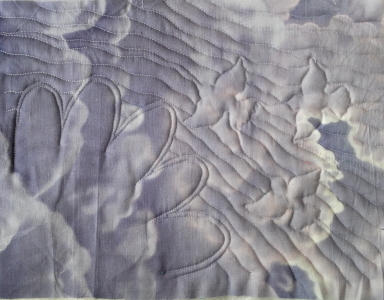 That definitely makes the petals look less pieced as it sort of obscures the seams. I like the way it has brought the petals to life. I think I will leave the center part for now and move onto the background. When we started this challenge, Emma was describing the perspective views to me so I could look for possible photos I could take. The "Looking Up" image was difficult as the only thing I could see was a plane flying by. At the time, I actually snapped the photo. It was a very grey day I might add. 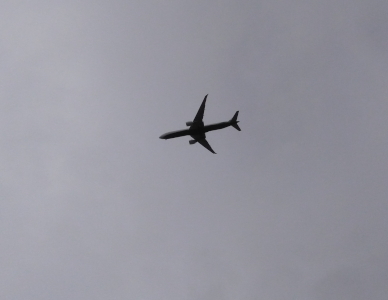 Of course, a plane isn't a natural element and at the time I had wished it was a bird. Unfortunately, a bird didn't fly overhead but it did give me an idea for my quilting. 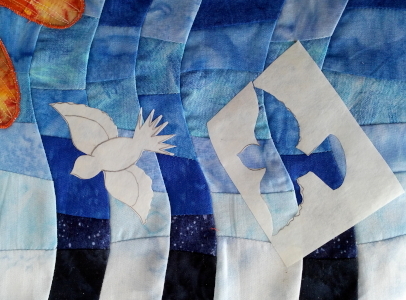 I decided to add some quilted birds on the sky background. ... then drew it on Freezer Paper to cut out for a template. 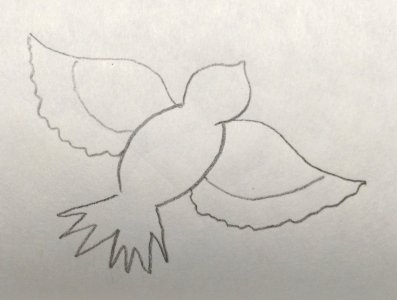 I only cut out one but used the cut-out section as a guide to know where I might place an additional bird. 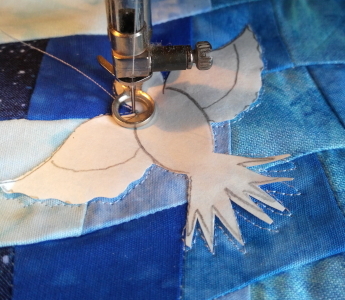 Using a light-weight thread, one I usually use for the bobbin but also love to quilt with, I quilted the first bird adding in feathers on the wings and tail. 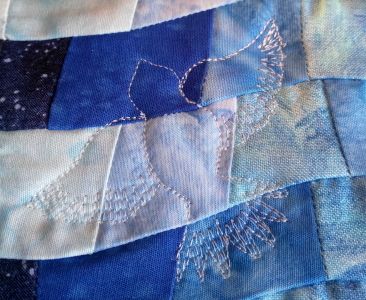 I did have to double track a little over the lines and I also needed to remove the paper to stitch the feathers. 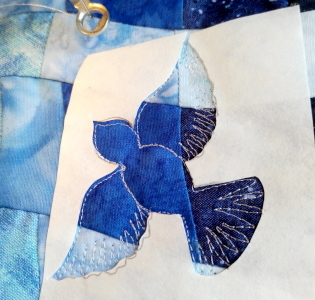 At this time I still had the cut-out section pressed on my background and I figured it was probably a lot easier to use that to quilt around as I wouldn't need to remove the paper to quilt in the feathers. It ended up being more accurate too. 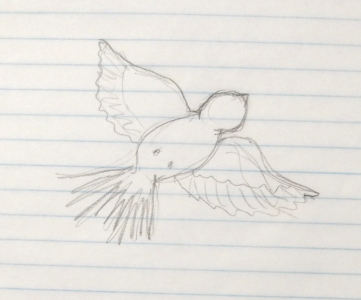 I added one last bird. Here's how the back looks. 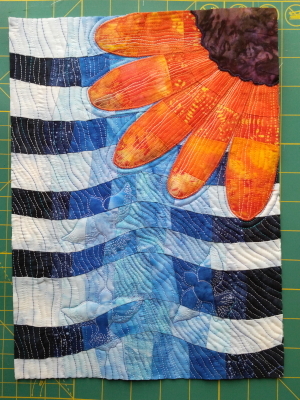 After this was complete I felt it still needed more background quilting but I didn't want to use more colored thread so went back to the light-weight thread and added two more lines between each of the blue lines. With it all squared up, now all that is left is to do the binding. This is such an interesting prospective! I love it! I especially like the quilted bird. 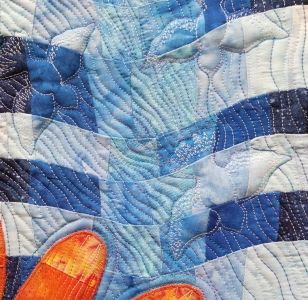 It seems to be the attention to detail in the quilting that brings the piece to life. Bleed to see what I can add to my piece. Thanks to both of you for a great challenge.